Grab your team mates and get ready for a mud and obstacle challenge designed to drag you out of your comfort zone and test your physical strength, stamina and mental grit. It's time to get muddy and help support people living with cancer. Simply click the 'Get a place' button, choose the day you would like to take part in the event and sign up. All of our charity places are for the full distance which is 8-10 miles of 25 obstacles. There is a £30 registration fee and we ask you to pledge to raise £300 to help fund our vital work. If you've already got a place in the event and would like to support us please let us know by clicking the 'I have my own place' button. Simply raise as much as you can and all the money you raise will go on to fund our vital work. Whether you're taking on the 5K distance or the classic distance, we'd love to have you on our team. The strength of one person is nothing compared to the power of a team. To help you gather the troops we're offering 20% off registration when you sign up together as a team of 3 or more members. Use promotional code TOUGH20 at checkout to sign up. Click the FAQ button above for more help. If you are registering to fundraise as part of a team and require various t-shirt sizes, please select that you will require no t-shirts on registration and get in touch with us to order them. Participants must be 14 or over on the day of the event. Any participants under 18 must take part with someone 18+. How do I register for a Tough Mudder? Step one - click the ‘Get a place’ button and complete the registration form. You will be asked to pay a registration fee of £30 and you must pledge to raise at least £300. Step two - within 7 days of completing your registration form you will receive an email from Tough Mudder with instructions on how to complete stage two of registration. Every participant must complete both the registration form on the Macmillan website, and the instructions emailed to you by Tough Mudder. The minimum age to take part in a Tough Mudder is 14. However if you are under the age of 18 you must take part with a responsible adult who is aged 18 or over. Is my registration fee refundable or transferable to another event? Registration fees are neither refundable nor transferable due to immediate administration costs incurred by Macmillan when you sign up. You must complete your registration form and pay your registration fee at least 4 weeks before the event date. How do I register as a team for Tough Mudder? Nominate a team captain. Please note the team captain will be asked to pay the registration fee for the whole team. The team captain should click the ‘Get a place’ button and complete their own details on the first page of the form. In section 2 of the form the team captain selects the distance the whole team wants to take part in. If any of your team want to do different distances, they should sign up separately. The team captain then enters the team’s sponsorship pledge. Please note the minimum sponsorship is £300 per team member. Next, the team captain selects ‘yes’ to entering as part of a team and enters a team name followed by the first name, last name and email address of all other team members. The team captain then selects if they want Team Macmillan kit. This kit order is just for the team captain. All team members will be asked if they want kit at a later stage. Complete the rest of the form using discount code TEAM20 to get 20% off registration. At this stage the team captain must pay for all team members. Check the terms and conditions and hit ‘Sign me up!’. Once this is complete each team member will receive an email inviting them to join your team. All team members must then follow the instructions in this email to complete their own registration. If a team member does not complete their own registration, they will not be able to take part in the event. What happens after I’ve registered on the Macmillan webpage? Within 7 days of completing your registration form you will receive an email from Tough Mudder with instructions on how to complete stage two of registration. Every participant must complete both the registration form on the Macmillan website, and the instructions emailed to you by Tough Mudder. Is my registration fee refundable or transferable? The registration fee is non refundable due to immediate administration costs incurred by Macmillan when you sign up. If one of your team members does not complete the initial team member registration form, and the event date is more than 3 weeks away, we can replace them with a new team member. Please get in touch to do this. I am a team captain, can I cancel my team members place? If team members have not completed their initial registration form, the team captain can nominate a new team member to take their place. Once a team member has completed their registration form, only they can cancel their place. The registration fee is non refundable in all cases. When will I receive my Tough Mudder event ticket? All participants who are taking part with a Macmillan charity place and have completed their registration will receive their Tough Mudder ticket 14 days before the event date. Please take this ticket along on event day, either on your phone or printed. If you haven’t received your event ticket please call us on 0300 1000 200 as soon as possible. When will I receive my start time? 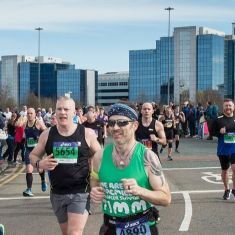 All participants who are taking part with a Macmillan charity place and have completed their registration will receive their start time 10 days before the event date. Will I receive the same start time as my team? Not all team members will receive the same start time. If you’d like to start together please choose your preferred start time that has been allocated to one of your teammates and arrive together, one hour before this time. Tough Mudder suggests that teams arrive at the earliest start time allocated to your team to prevent holdups. If you are taking part as a team, please head to the Start Time Look Up Tent on arrival and they will ensure you can start together. Can I pick my start time? 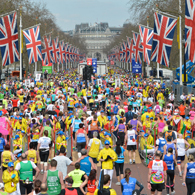 If you are taking part on your own, you must turn up one hour before your allocated start time. If you are taking part as a team and would like to pick your start time, please get in touch with us as soon as possible. Call 0300 1000 200 or email running@macmillan.org.uk. Do I need to purchase parking? Yes. If you plan to park at the event site you will need a parking ticket. You can purchase parking once you’ve received your event ticket from Tough Mudder, approximately 14 days before your event, or you can purchase it on the day. It is cheaper to purchase parking in advance, online. Once you’ve received your ticket from Tough Mudder, go to www.active.com and create an account, or sign in if you already have an Active account. Tough Mudder use Active as their registration platform, therefore your Active account must be registered with the same email as your Tough Mudder ticket. Once you’ve signed in, click on your name in the top right corner of the screen and select My Events. Then click the blue Claim Registration button at the top of the screen. Enter your registration number found on your Tough Mudder ticket. This will add your ticket to your account. Under the ticket select Purchase Merchandise. At the bottom of this page you will have the option to purchase parking. Remember to bring along your parking ticket on event day. Do I need to sign an event waiver before event day? All participant and spectators must sign a waiver to enter the event site. You will be able to sign your event waiver on the day when you arrive. Yes. All spectators have to pay to watch. 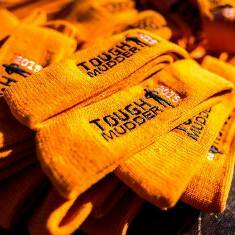 Spectator tickets are cheaper to buy in advance from the Tough Mudder website. Head to www.toughmudder.co.uk/events, select your event and then click the Digital Info Pack at the top of the event page. Then select Event Day Information and you will see the option to buy spectator tickets. What should I take on race day? Your event ticket, photo ID & any parking tickets you’ve purchased. Remember to bring a spare change of clothes for after your run and £3 (cash or contactless) if you’d like to use the baggage drop. And don’t forget to take along your Macmillan running top! I have my own placeIf you have secured your own place, click here and join Team Macmillan today. Get a placeWe ask for a registration fee of £30 and you must pledge to raise a minimum of £300 in sponsorship. it could pay for a Macmillan nurse for a week.